Christina O’Neil is the November Student of the Month! Home/News/Christina O’Neil is the November Student of the Month! 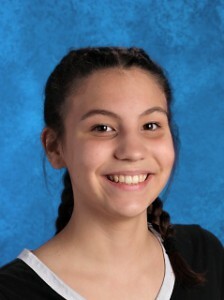 Congratulations to JA-7 student Christina O’Neil for being selected as the Student of the Month for November! Christina’s favorite classes are art, English, and math. Her favorite teacher is Ms. Nash. She has a goal to read the entire Harry Potter series in one month! Christina is proud that she always makes it on to the Principal’s Honor Roll list. She also enjoys participating in Cheer. Miss Poppleton: Christina has been awesome in math, always coming in with a positive attitude. She is willing to help the people around her and her patience is incredible. Ms. Nash: Christina has been through many hardships in her personal life, and she arrives each day smiling, vivacious, and excited. She takes care of her little brother, making sure he eats breakfast, has a decent lunch and gets to class safely. Not only does she participate enthusiastically in all class activities, her work goes above and beyond. Christina clearly cares about her successes and for those around her.